The entroido de Ribeirao is an ancient festival celebrated in the Santiago de Arriba parish, high in the mountains of Galicia, Spain which welcomes the coming of spring in a rather unusual and, at times, scary fashion. Previously banned during the Spanish Civil war, the Ribeirao celebrates the coming of spring, affording locals the opportunity to dress up and charge through the potato fields and cabbage patches of their mountainside village. The prohibition didn’t stop celebrants from engaging in the ancient hijinx, however, and masked revellers would still run through the village challenging the local police and scaring ordinary people into their homes, VICE reports. The participants, known locally as "Volantes," "puchos" or "maragatos," that run through the fields have been forced to change their route in recent years following complaints from one local farmer about damage to his crops – but the mischievous spirit of the festival remains strong. "It is a festivity which symbolizes the calling for spring. 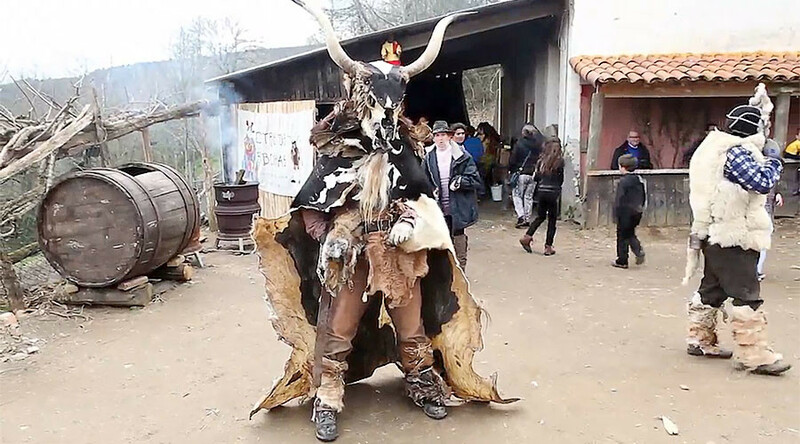 It is an ancestral rite, not only in Galicia but in the whole of Europe, with shamanic or totemic characters, or however you want to call them, who make a representation of the calling for spring," Xose Manuel Zeixas, one of the celebrants, told Ruptly TV. In medieval times, ordinary peasants could gather during the festival and satirize societal problems at the time without fear of reprisal from their feudal lords, hence the rather frightening animal carcass masks.